I won’t be making him up into anything for a while, I’m going to finish off the other 3 designs then, when the season is nearer, I’ll decide if I need ornaments or cards. 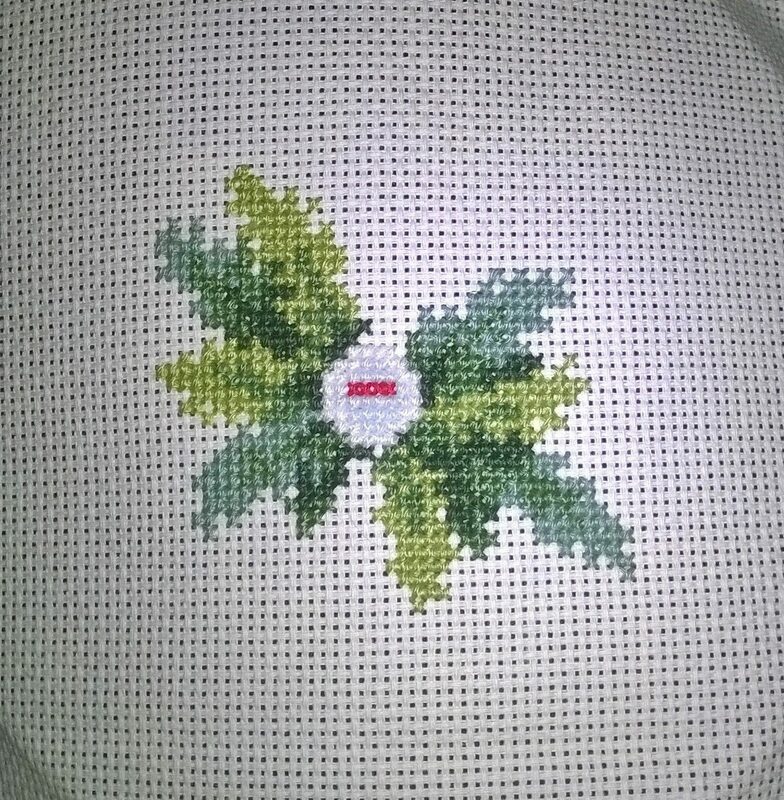 I’ve made a start on Ornament number 4, but it doesn’t look like anything very much just yet! 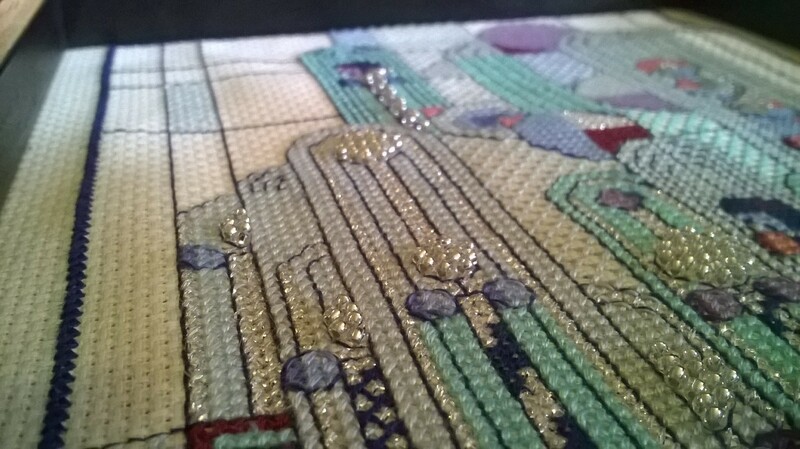 There are about six different shades of green in here so far, I’m glad to be stitching this now rather than in the rubbish light of Winter! I never did find a frame I liked for the tapestry kit I did last month, so I’m just going to post it here bare! I haven’t done any tapestry since primary school, so this was a fun little project. 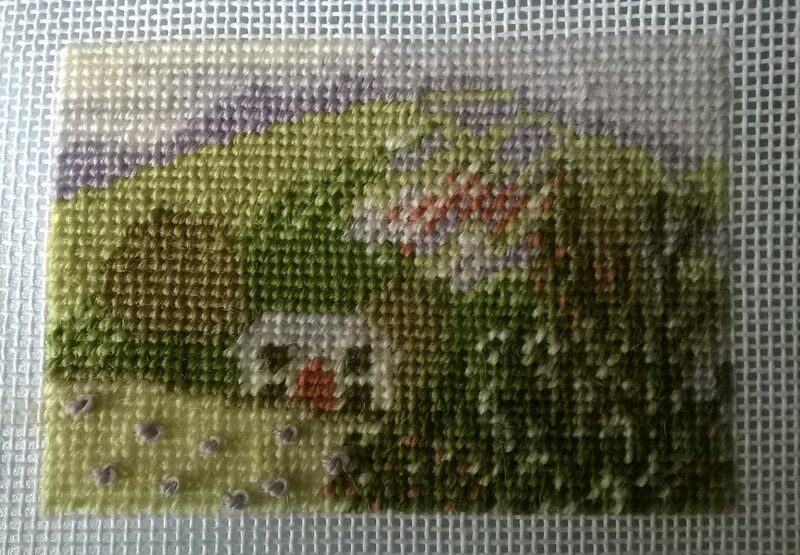 My Nana has cleared out a ton of her old cover kit stash and turned it over to me, and I loved this little countryside scene so I stitched it up immediately. Obviously it’s much quicker to stitch than cross stitch or embroidery, but the quality of the wool was pretty poor so I didn’t totally love making it up. 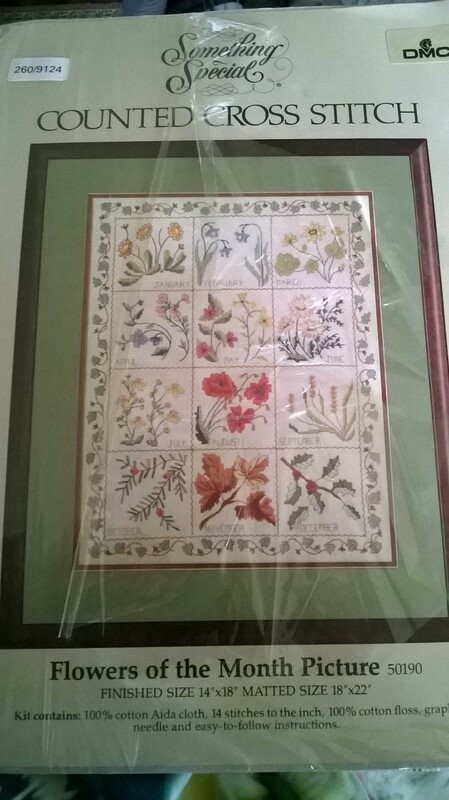 I’ll go have a trawl around some charity shops later this weekend to see if I can chance upon a correctly sized frame for it, I would like to give it back to my Nana to go on the wall of her new bedroom. 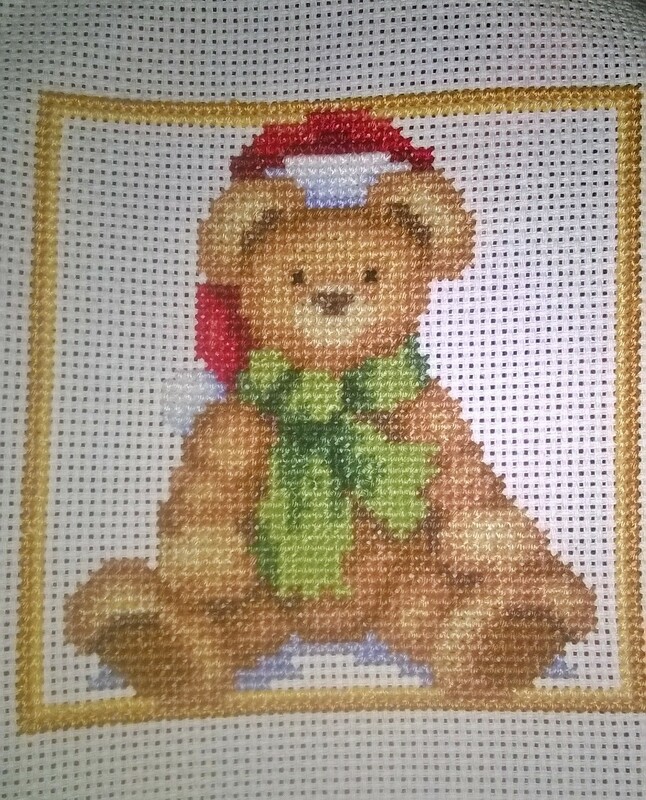 He needs some backstitch, couching and beading but I want to get him finished this weekend too. I’m not 100% sure yet if I want to make him up as another ornament or if I think he might be better as a card for a young neice – but then I’ll have an odd number of ornaments! I’ve just finished the second ornament from the Dimensions ‘Beaded Elegance’ kit, and I was looking for a slightly more professional looking finish than my last one (the Snowman, here). While hunting the internet for inspiration, I found Pinwheel Ponders, a blog almost entirely dedicated to a huge variety of cross stitched Christmas ornaments in dozens of shapes and finishes, with incredibly detailed instructions and helpful pictures for every step. I followed Ms. Pinwheel’s instructions to the letter, and was really pleased with how much better this ornament looks than my last one! Look at those sharp corners! Ms. Pinwheel’s instructions truly are foolproof if even someone as inexperienced as I managed to achieve these results! I even had a go at making my own braid to go around the edge and hide the seam, which was a bit of a trial-and-error sort of affair in terms of making enough braid to go all around. I tried triple, then quadruple the necessary length and still came up a little short. 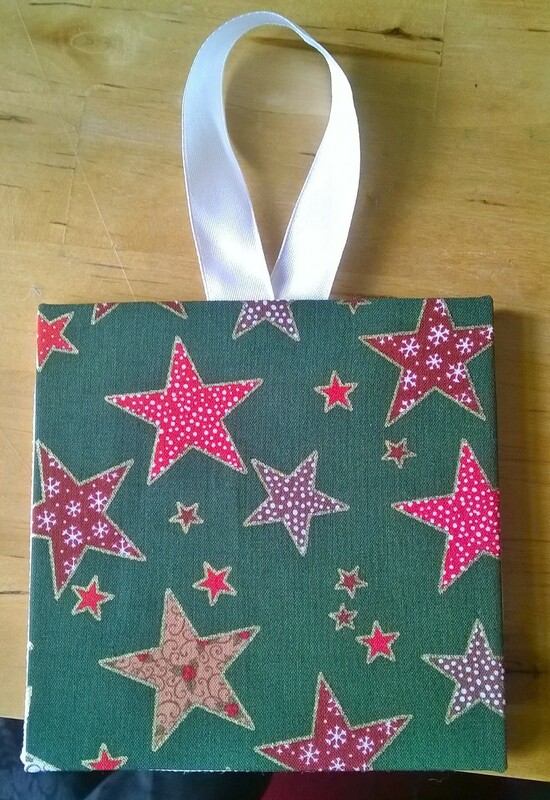 Unfortunately, by my third try I had run out of thread so I had to make do with what was left, and do my best to hide the joins with the big white ribbon loop. Overall, I’m really proud of myself and I know what to improve for next time – there are four more ornaments to go and by the last one, I hope to be an expert! Many thanks to Ms. Pinwheel and her wonderful blog too! Now, for a change, I’m going back to work on my Pokemon project for a bit – I’m really in the mood to get stuck back into something big and challenging for a while. Skyscape is done, pressed and framed! Hooray! Please excuse the horrible wallpaper, my apartment is a rental so I can’t change it no mater how much I want to! 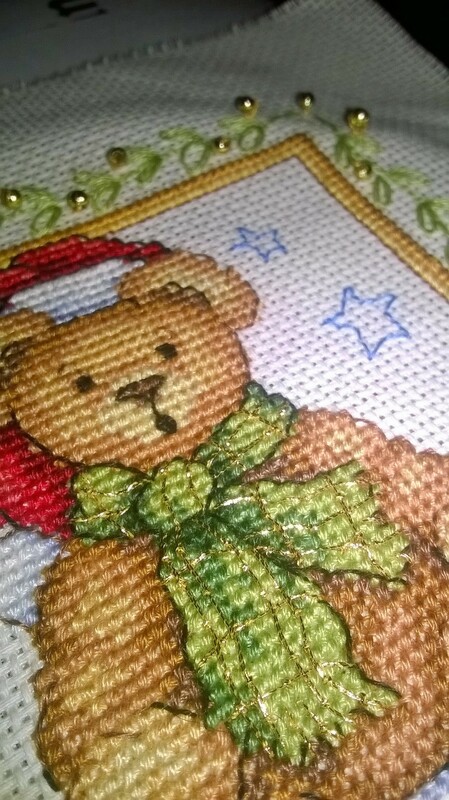 Really good quality materials, even the metallic thread was a pleasure to stitch with. 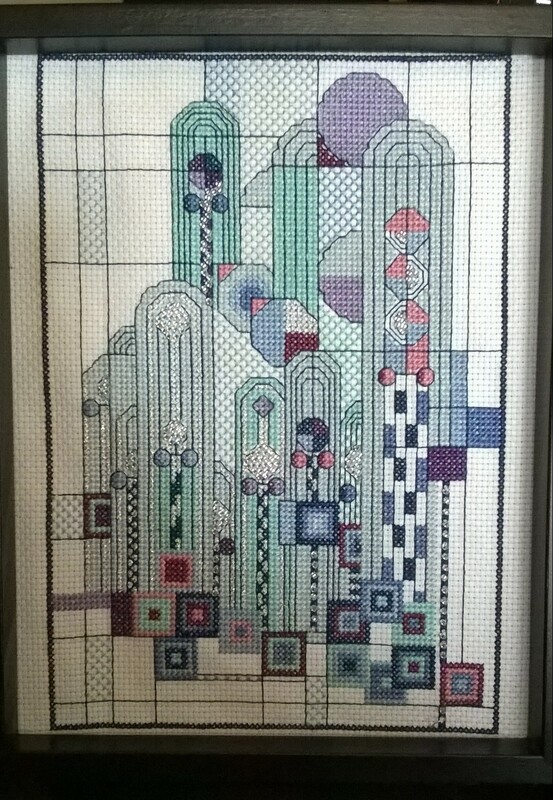 I adore the designs in the series, art deco is one of my favourite styles and I think they’re really unique and unusual. They look really modern and elegant displayed in a home compared to some of the more traditonal / old fashioned designs available. Super simple to follow chart in a large print, with an easy-to-read key and symbols. 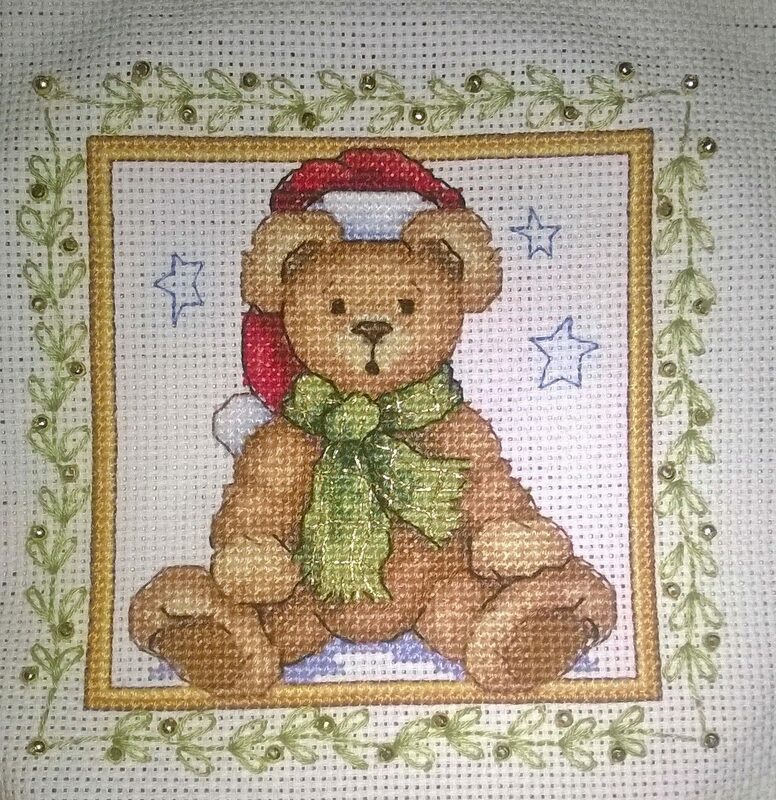 It was very fun to stitch and quick to complete, with lots of large areas of the same colour. Nowhere near enough silver metallic thread provided, I ran out less than halfway through the project. However, one quick email to Classic Embroidery and there was a brand new skein posted to me free of charge. There was plenty of all the other materials. Black and white only chart – not that colours would have helped me much, but I know some people prefer it! I have really enjoyed stitching Skyscape so far, and have done quite a bit of it (by my standards). I felt like I was on a roll! However, I have not even got halfway through and I have run out of the silver thread supplied in the kit. 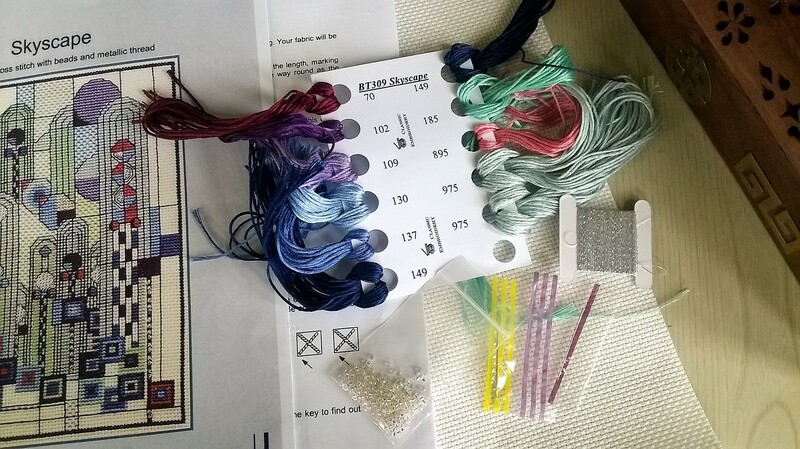 I have several different silver threads in my stash, but none of them match exactly, and I don’t have the time to unpick all of the silver just so I can re-do it in a stash-friendly colour. 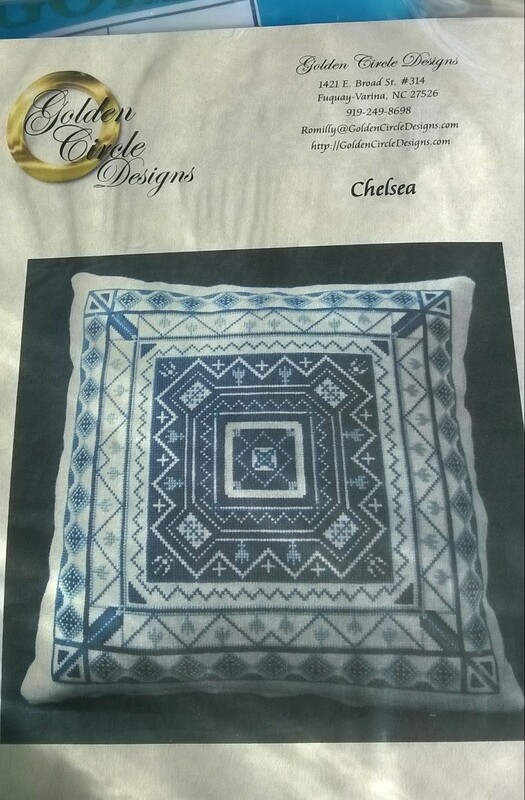 I’ve contacted the kit manufacturer, Classic Embroidery, who have promised to send me some more, free of charge, as soon as they re-open…but that isn’t for another week or so yet. 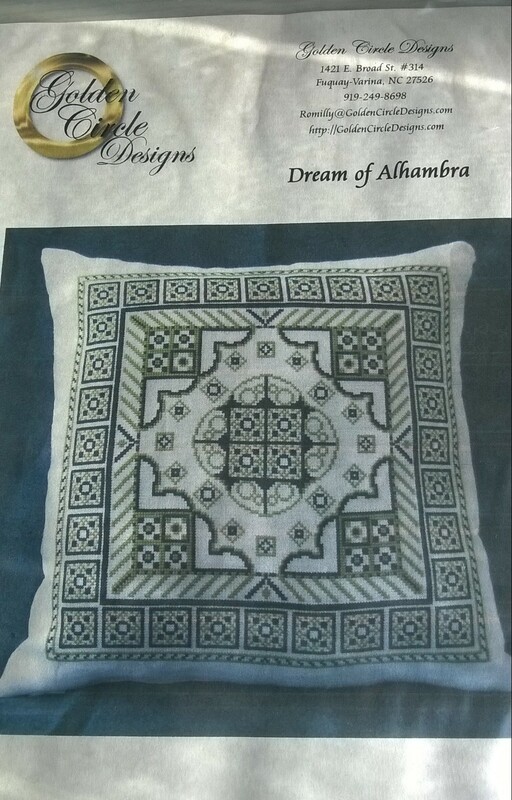 I am very pleased with their customer service, but just a little disappointed that I can’t keep stitching right away! My question now is this: should I do all the other colours and fill in the silver last when it arrives in (hopefully) 2 weeks time? Or should I give in to temptation and start a new little project while I wait? 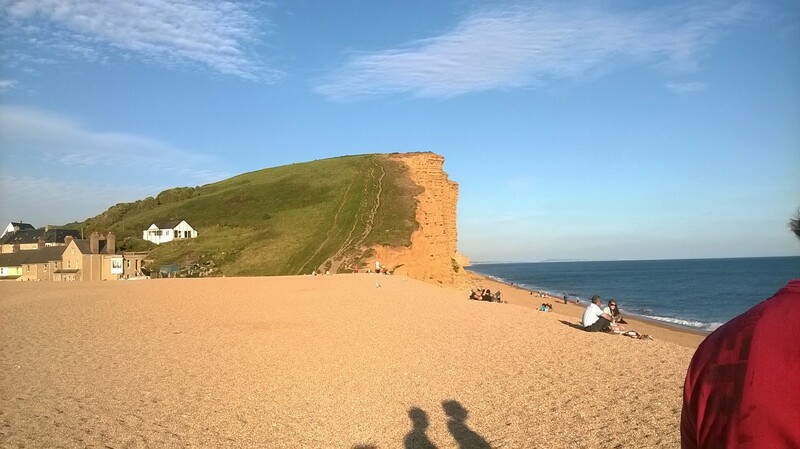 I’ve just got back from a lovely break in Dorset (on the South coast of England for my overseas readers), and had every intention of updating my blog with all the stitching I had got done over the holiday. 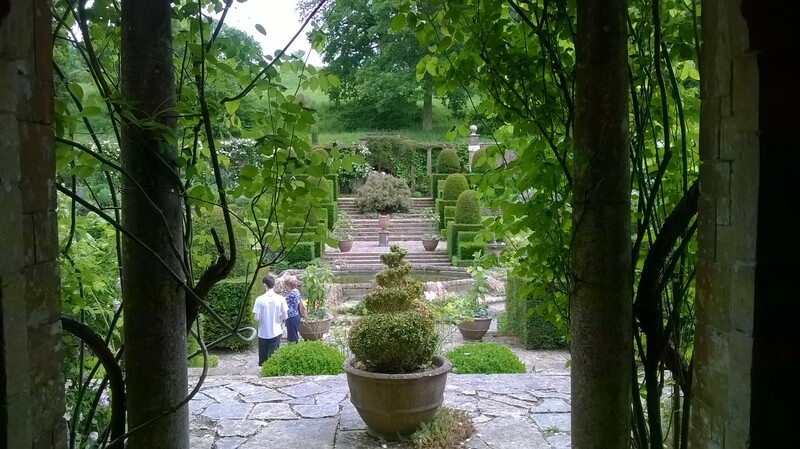 However, as is so often the case, the holiday was so full of activities that I ended up doing very little! The sun shone almost all the time, so there was lots of shooting, sailing and sightseeing, as well as cider-tasting, fossil-finding and garden-visiting; by the time I made it back each evening, I was far too tired to sew. 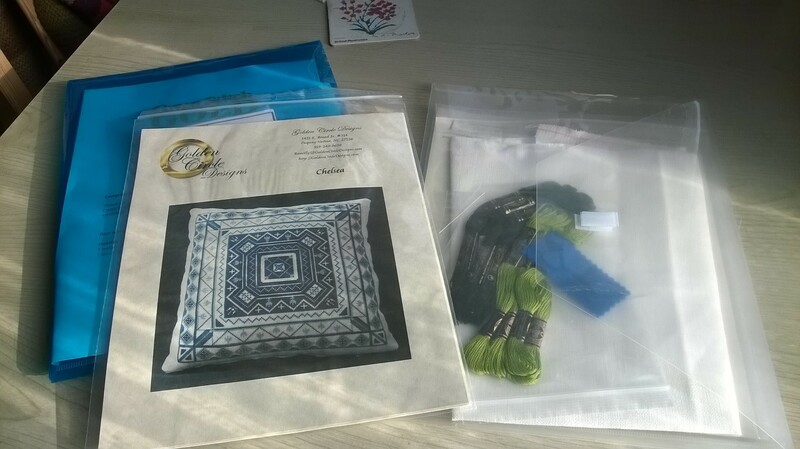 I did treat myself to a few charity-shop bargains, including a dozen or so pre-2000 Cross Stitcher magazines – the 90s nostalgia is powerful, and the fashion choices now somewhat questionable, but old cross stitch designs are still great even if they require some adapting to bring them up to date. I also snagged this DMC kit, ‘Flowers of the Seasons’, for a couple of pounds which seems to have been discontinued sometime when I was still in school!! Not sure that I’ll ever actually stitch it but it is still in good condition so it will probably end up on the old Ebay store in due course. As you can see, I got an awful lot done…or not! 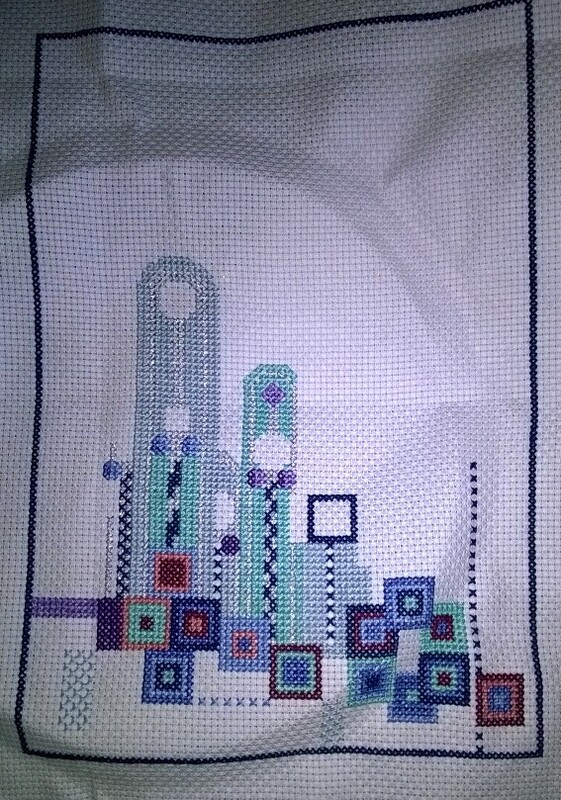 This is the Art Deco Skyscape by Barbara Thompson, which I got from Choices HERE, along with a matching design from the same range. 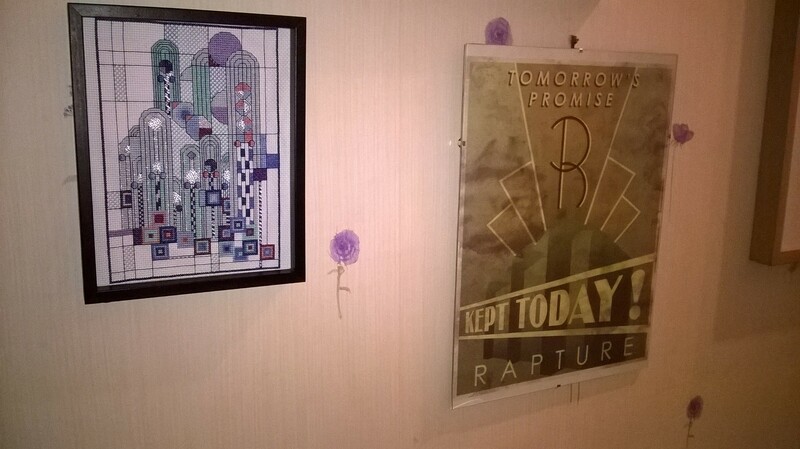 I was immediately drawn to this picture for several reasons, it would match the decor in the living room, and it contains shiny beads being just two – but mostly it reminded me of one of my favourite video games, Bioshock. 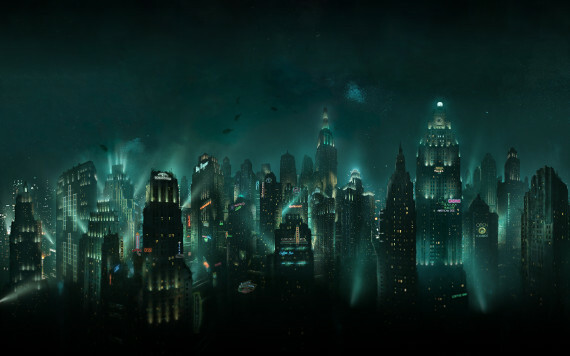 In this game, you are exploring a massive underwater metropolis called Rapture set in the 1960s, but with heavy art deco influences in the design of the architecture and the character’s costumes. I thought the blues and aquas in the kit were reminiscent of the ocean, and the beads made me think of pearls and the softness of lights seen through water. In any case, now I have yet another half-finished project on the go as my main holiday souvenir, along with half a dozen bottles of mead and a sunburned nose!